Take cover there is a total disturbance happening and if you participate, be prepared to laugh, scream, have a hoot and a ball, a bingo ball that is! Bingo Riot is a gas exploding with the excitement of so many Bingo variations, you won’t know which room to enter first. Ok, granted the color scheme of this site is; how shall we say pretty “typical” splashed in pink and yellow. But there is nothing humdrum about Bingo Riot when it comes to what matters most with a dynamic collection of products. Established in December 2012, they have come a long way in short amount of time building a stellar community of players. It is easy to understand why with a platform powered by a leader; Cozy Games software. This is another site under the Winners Bingo Network (WBN) which means high standards and an integrity players can rely on. Bingo Riot bears the eCogra seal and is fully licensed and regulated in The Isle of Man. A happy bingo player has the luxury of an array of variants and there is plenty with UK’s popular 90, US’ 75, 80 ball and the speed action of 30 ball bingo. Progressive Jackpots are always looming and tempting players with sizeable cash prizes. There are over 30 Video Slots to choose from, not an enormous amount compared to some other sites but it satisfies the craving to spin with exciting themes and special features. With thrills like Monkey Business, Chasin Treasure 2 and King of Slots 2 amidst of much more their ample of entertainment. Casino Games include the most popular choices with Blackjack and Roulette for players looking for a change of pace. Video Poker and Scratch Cards complete the lobby of gaming. Get a true sense of Bingo Riot and benefit from the Free No Deposit trial offer. This allows players to explore the platform of games risk free in what is basically considered fun mode. Discover your favorites and play them in real money mode, but not before you take advantage of the Bonus on your first deposit. Reload Bonuses are available on all re-deposits. Check the Promotions page on a regular basis and stay in the know for the latest current offers. The VIP program rewards loyal players with Cash-back, monthly drawings, exclusive Bonuses and gifts. However, players can lose their status if deposits are not maintained in two consecutive months. Minimum deposit is £10, minimum withdrawal is £25 in a 7 day period. We rate Bingo Riot 3 Pink Hearts. This site definitely has a lot of great things to look forward to! For a brand new site, I was definitely impressed with what they have to offer. As soon as I joined, I received $15 free, with no deposit required. In addition to this no deposit offer, they also keep on giving away the free stuff by awarding you with 750% worth of bonuses on your first few deposits. You can’t go wrong with the gaming selection here. They have three types of bingo variations up for grabs. This includes 75, 80 and 90 ball as well as a number of very nice jackpots to try for on a regular basis. 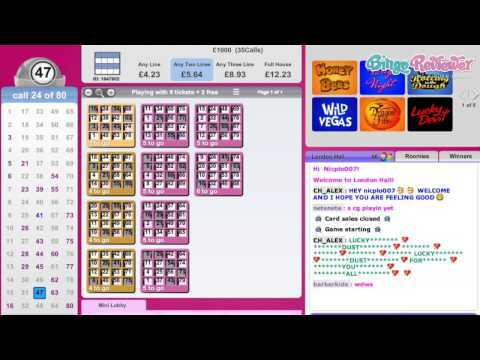 Aside from bingo, they also have plenty of video slots, casino games and scratch cards. They are also supposedly getting a mobile version of the site very soon which I am really looking forward to! Overall, really nice site! While I really enjoyed this Cozy Games site, I can't justify the layout that is literally hurting my eyes. The neon pink/yellow color combination is all but pleasant to look at, and they should hire a professional to fix it. Other than that, I found very little to complain. The registration was fast, and you get a nice $15 no deposit bonus to start with (along with good depositing bonuses). One thing though, in order to check out the rooms, you have to be registered. They have 75, 80 and 90 ball games, which covers all the most popular variants, and I just want to see they also include 30 ball games that I specially enjoy. They include a nice number of Slots (31 at the moment), regular casino games (just 6, including blackjack, roulette and keno, no poker) and 9 Scratch card games. One of the things I value the most at online casinos is a fast payout, and these guys are good, with just a couple of days waiting period, in my case.